Montague township, where settlement on the Rideau River began in 1790, is the oldest township in Lanark County. Ninety persons were living in Montague township in 1802, according to a local census. Included were families of the name Arnold, Chester, Covell, Haskins, Hill, Hodgins, Jarvis, Merrick, McCrea, McIntyre, Nettleton, Nicholson, Stafford and Van Dusen. The Arnolds were Henry and Richard, sons of General Benedict Arnold; and Hannah Arnold, the sister of the General. John Arnold, born 1786, another of General Benedict Arnold’s sons, lived in Kitley township, Leeds County, where he is buried with members of his family in Leahy’s cemetery near Frankville. The nine Merricks named were the family of William Merrick, whose building of mills on the Rideau River in Montague township in the 1790’s originated the village of Merrickville. First Canal Transportation – Rideau Canal, 1832; Tay Canal, 1834. First Township Officers – Elected in the early eighteen-twenties. An 1835 Act provided for officers including an assessor, a collector, a clerk and three commissioners with narrowly limited powers, together with overseers of highways and poundkeeprs, for each township of adequate population. First Continuous Fall Fair – Bathurst District Agricultural Society, formed at Carleton Place, January, 1840. First Member of Parliament of United Canada – Malcolm Cameron (1808-1876), elected 1841, defeated Sheriff John A. H. Powell, became cabinet minister in several administrations, member of Legislative Council, Queen’s Printer, and member of Parliament after Confederation. Re-established the County’s newspaper at Perth in 1834 under the name Bathurst Courier. First Township Elections of District Councillors – January 1842, under an Act transferring regulatory duties from appointed magistrates of court of quarter sessions. This District’s area was changed by withdrawal in March 1842, of Carleton County’s present townships of Goulbourn, Newpean, March, Fitzroy, Torbolton and Huntley, and in 1845 by the entry of Montague, N. Elmsley and N. Burgess townships. First Power Looms for Weaving Cloth – Installed in James Rosamond’s woolen factory, Carleton Place, 1846. First Municipal Government as County – Came in 1850 under Municipal Institutions Act of 1849 which abolished district councils and placed county and other forms of municipal government on an enduring basis. First Warden of United Counties of Lanark and Renfrew, 1850, was Robert Bell, M.P., Carleton Place. First Incorporated Urban Community – Perth, as a town, September, 1850. First Railway Transportation – The Brockville and Ottawa Railway, 1859, extending then from Almonte, Carleton Place, Perth and Smiths Falls to the Grand Trunk Railway at Brockville. First Royal Visit – By Albert Edward, Prince of Wales, the future King Edward VII, in 1860. First Separate Government as County – The two United Counties separated in 1866, Perth remaining as county seat of Lanark. Warden, Daniel Galbraith of Ramsay township. First Members of Dominion Parliament – North Lanark; Hon. William McDougall (1822-1905), minister of public works, later active in transfer of much of Canada’s north and west from Hudson’s Bay Company. South Lanark: Alexander Morris (1826-1889), son of Hon. William Morris of Perth, and later a cabinet minister, chief justice and lieutenant governor. First Canadian Senators – Hon. Roderick Matheson and Hon. Henry Graham, Perth merchants; Hon. James Shaw, Smiths Falls merchant. First Members of Ontario Legislature – North Lanark: Daniel Galbraith (1813-1879), later M.P. for North Lanark, 1872 to 1879. South Lanark: William McNairn Shaw (1823-1869), barrister, born Ramsay township. First Railway to Ottawa – 1870, from Carleton Place. Bell Telephone Company, 1885, including Smiths Falls, Perth, Carleton Place and Almonte. In mills including Peter McLaren’s Carleton Place lumber mills in early 1880’s; first community lighting service, Carleton Place, September, 1885. First Roller Process Flour Mill: Carleton Place, February, 1886. First Century of Settlement – 1890; hundredth anniversary of first settlement by a family of European racial origin in area of the present Lanark County, the first Ontario permanent settlement north and west of the Rideau River. James E. Bennett had established a reputation for honesty and service early in the game. It was carried on for three generations. The businessman left his mark politically as well. Like almost every other merchant he took his turn in municipal politics, holding the office of mayor from 1904-06. He set a pattern for what he expected the business to be…a service industry that met the needs of the town honestly. He probably expected his sons, grandchildren, and great grandchildren to carry on as long as they were able to do so, and in the same fashion. Had he lived, he would not have been disappointed. Today, the old stone building still serves as a meat market, as Danny Joly continues to meet the same high standards set by that original butcher more than 100 years ago. James E. Bennett would be pleased. Resident magistrates and other municipal reforms were among the governmental needs seen by progressive residents of Ramsay township in the ninth year of the settlement of the township. These views of a Ramsay township gathering were sent to the Perth editor for publication. Resolutions of a Public Meeting held in the Township of Ramsay on Monday the 4th January, 1830. Resolved, 1st– That this meeting, viewing with alarm the manner in which they have been treated by his Majesty’s Justices of the Peace for this District as far as concerns their Town Meetings, will petition His Excellency Sir John Colborne concerning the same. 2nd – That his Majesty’s Justices of the Peace are obliged by Law to grant a warrant for calling and holding our Town Meetings, and also a Constable to preside at the same. 3rd – That without said Warrant, a lawful intimation and a presiding Constable, our meetings are illegal, and of course our whole procedure at said meetings. 4th – That our present situation is not only unpleasant but disadvantageous, having neither overseers of roads, assessors, nor any office bearer whatever in the township. 5th – That some of our office bearers have been put to blush by those in authority, when applying to be installed in office, by being told they were not legally elected, as this town meeting was illegal. 6th – That the want of resident Magistrates in this township has and still does put us to great disadvantages in many respects, and the more particularly as concerns our office bearers, causing them to travel from home to Perth (no Magistrate being nearer) for the express purpose of being sworn into office, under the penalty inflicted by law, a distance of from twenty to thirty-five miles. 7th – That petitions formed on the basis of these Resolutions be drawn up and transmitted to the Hon. W. Morris Esq., M.P., to be by him presented to His Excellency Sir John Colborne on our behalf. John Hutchinson, President ; William Wallace, Vice-president ; Committee : John Buchannan, James Bryson, Robert Carswell, Daniel Shipman, John Gemmill, Michael Corkery. We understand that a meeting of the delegates from the four Townships, Ramsay, Lanark, Dalhousie and North Sherbrooke, will be held this day, the 22nd January, in the village of Lanark, for the purpose of taking into consideration the condition of the Society settlers, and the profriety of petitioning the House of Assembly to grant them all the civil privileges which our constitution bestows. Two persons deputed from each of these townships will attend. We have received a communication from an esteemed friend pointing out some of the difficulties under which those labor who have not yet received their Deeds. A further six years of struggle for responsible government were to pass before these numerous Scottish Emigrant Society settlers of 1820 and 1821 and the Irish assisted emigrants of 1823 were to receive their deeds and their voting rights. To Let. The House and Premises in Lanark formerly occupied as a Government Store and lately fitted up as a retail store. From its central location and bordering on the river Clyde, it possesses advantages either as a private dwelling or for a person in business. Terms moderate, apply to W. Fraser, Esquire, Lanark, or at Perth at the subscriber. – April 27th, 1830. W. Fraser. A parting editorial picture of Perth in the winter of 1829-30 is given in terms of praise and future promise in the Bathurst Independent Examiner. Our merchants and operatives are all busily employed and seem to be flourishing. A complexity of rival interests has brought the price of all store goods to their proper level, so that the settlers do not, as many did formerly, travel a great distance to a neighbouring district to sell the surplus produce of their farms and to purchase articles for the use of their families. The stores are abundantly supplied with goods of the best quality, which several of our merchants import directly from the home market. The few stores in this town must, at the present time, contain nearly 20,000 pounds worth of goods. A number of excellent houses have been built in the course of last summer ; some are making rapid progress to completion. The public buildings are neat and commodious. The houses of public worship for the different denominations (with the exception of the Methodist chapel, which is partly raised) are decent and comfortable, not to say elegant, considering the age of the place. Although a large number of Half-Pay-Officers and Pensioners are settled in the town and its environs, whose habits are supposed to be of the most convivial kind, it has not been found necessary to establish….a temperance society. The industrious and respectable population live in the fullest enjoyment of harmony and sociality, notwithstanding that a few Lawyers have crept in among us. The Carleton Place scene of the Eighteen Seventies is reviewed in the present section of a continued account. The larger industrial plants opened here in the Eighteen Seventies were the McArthur and Hawthorne Woollen Mills and the Gillies Machine Works. Others included a lime kiln, which still remains in operation, and two planning mills. 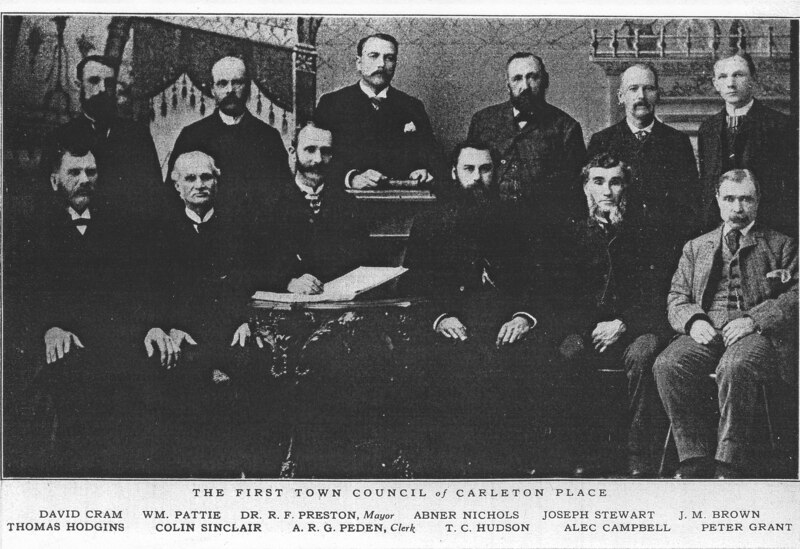 As a village of 1,200 persons the municipality of Carleton Place was first incorporated in 1870. A town hall was built and was converted within a few years to help meet the public school needs of an enlarged population. A new high school remained unused during several years of municipal dispute. A great fire destroyed a lumber yard stock valued at over $125,000. A lengthy business depression placed severe limits on the country’s prosperity. Western migration of the district’s sons continued, and began to reach the new province of Manitoba. 1870 – Carleton Place was first incorporated as a separate municipality by a county bylaw effective in November 1870. Its future growth was assured when at the same time the Canada Central Railway line was opened for use between Ottawa and Carleton Place, connecting here with the Brockville and Ottawa Railway Company’s tracks which extended from Brockville to Arnprior and Sand Point. Building of the first stone structure of the present Bates and Innes Woollen Mill was begun by Archibald McArthur and was completed a year later. The central building was five stories in height. Other building construction included the present Central Public School on Bridge Street, later enlarged ; the present Queen’s Hotel, also later enlarged, built for Duncan McIntosh of Perth, father of the late Dr. Duncan H. McIntosh of Carleton Place ; and about fifty residences. The Carleton Place grist and oatmeal mills were taken over from William Bredin by Horace Brown (1829-1891), in partnership with W. C. Caldwell of Lanark, and were further equipped to manufacture wheat flour. In the Fenian Raids of 1870 the Carleton Place Rifle Company, which had become No. 5 Company, 41st Regiment, served on duty at Cornwall under Captain John Brown of Carleton Place, and numbered fifty-three of all ranks. It included the regimental band under Bandmaster J. C. Bonner, proprietor of a local music store. Lieut J. Jones Bell (1845-1931) of the Carleton Place Company was serving at this time in the Red River Rebellion expedition. 1871 – Elected officials of this newly incorporated community were chosen in January 1871. Those elected were Reeve Robert Crampton, general merchant, and Councillors Patrick Galvin, tailor ; John Graham, wagon maker ; Dr. William Wilson, surgeon ; and William Kelly, innkeeper. School trustees elected were James Gillies, lumber manufacturer ; William Taylor, hardware merchant ; William Bredin, mill owner ; Patrick Struthers, general merchant and postmaster ; and Allan McDonald, woollen manufacturer. Other officers were James Poole, clerk ; James Gillies, treasurer ; James McDiarmid, assessor ; William Patterson, tax collector ; Joseph McDiarmid, assessor ; William Patterson, tax collector ; Joseph Bond, constable and road commissioner ; William Morphy and Brice McNeely Jr., pound keepers ; and Finlay McEwen and John Brown, auditors. 1872 – The first Carleton Place Town Hall was built on Edmund Street and opened in 1872. On the ground floor of the two storey stone building was the council chamber, a jail and caretaker’s living quarters. The second storey served as a hall for public gatherings. James Docherty built the Moffatt planing mill on the former Fuller foundry property at the south shore of the river. In the McArthur cloth factory (now Bates & Innes) ten new looms were added. Napoleon Lavallee removed his hotel business to his large new stone building at the corner of Lake Avenue and Bridge Streets. John G. Haggart (1836-1913), Perth miller, was elected member of Parliament for South Lanark. He continued to hold that seat for a record period of forty-one years and was a member of several conservative cabinets. 1873 – A lumber industry change in 1873 was the sale by John Gillies to Peter McLaren of control of the Carleton Place sawmill and Mississippi timber limits of the Gillies and McLaren firm. The Gillies interests of Carleton Place bought sawmills at Braeside, together with some 250 square miles of timber limits at a price reported as $195,000. 1874 – Members of the Carleton Place Council were John Graham, reeve, and William Taylor, John F. Cram, Dr. William Wilson and James Morphy. Public billiard and pool tables were prohibited. The next year’s Council permitted their operation under municipal licence. 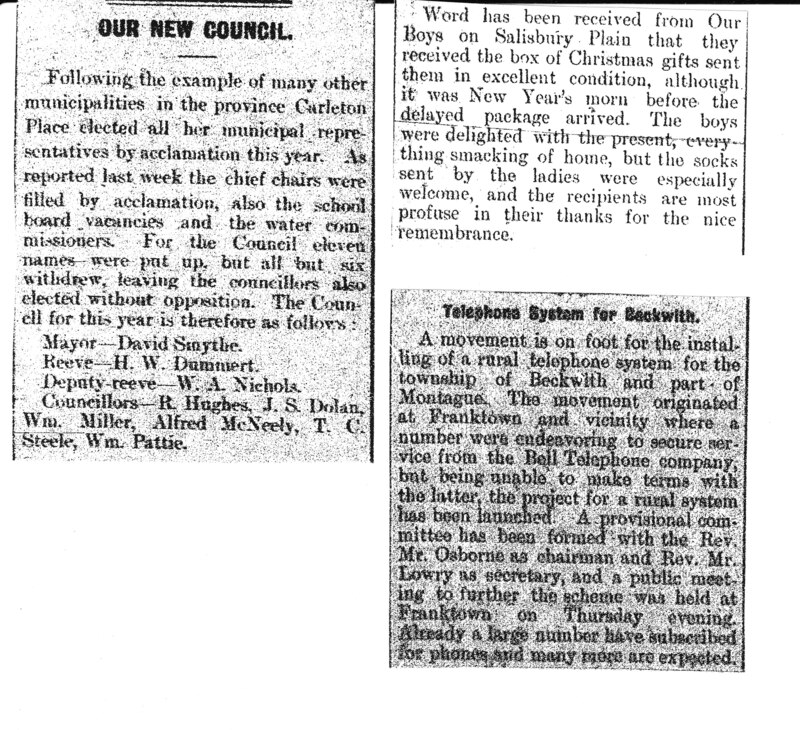 A press report stated the Council of Carleton Place have passed a by-law prohibiting the keeping of billiard, bagatelle and pigeon-hole tables for public resort in that village, under a penalty of not less than $25. The reasons for this stringent step as set forth in the preamble to the bylaw are contained in the following paragraph : As gambling is a vice of a very aggravated nature, which encourages drunkenness, profane swearing and frequently causes the ruin of both body and soul of those addicted to it, and not infrequently murder, it should therefore be discountenanced and suppressed within the Corporation of Carleton Place. P. T. Barnum’s Great Travelling World Fair, Museum, Menagerie, Caravan Circus and Colossal Exposition of all Nations will pitch its Mighty Metropolis of twenty Centre Pole Pavilions at Carleton Place on Wednesday, July 15 and at Perth on Thursday, July 16. 1874 – A volunteer fire brigade, the Ocean Wave Fire Company, was organized at Carleton Place. The municipality bought a hand operated pumper fire engine for $1,000 and a $200 hose reel cart. Members of the committee appointed by Council to organize the brigade were William Patterson, William Kelly, A. H. Tait, James Shilson and Abner Nichols. The new brigade’s initiation to fire fighting was the McLachlan lumber mills fire at Arnprior. In the first stages of a five year business depression two new industries were started here. They came with the building of the three storey stone structure of the Gillies Machine Works on the north side of the river at the lower falls, and the opening of the four storey stone woollen factory of Abraham Code, M.P.P., later known as the Hawthorne Woollen Mill. Mr. Code was a member of the Ontario Legislature for South Lanark from 1869 to 1879. 1875 – A ten year losing battle was begun by Peter McLaren (1831-1919), owner of the largest lumber mill at Carleton Place, for monopoly controls over the navigation of logs on the Mississippi River. It was fought between the government of Ontario and the Dominion, by physical force between opposing gangs of men on the river, and in the courts of Canada and England. In the opening rounds of 1875, men of the Stewart and Buck firm brought their drive down the river to the Ottawa after cutting a passage through a McLaren boom at the Ragged Chute in Palmerston, and a twenty foot gap through a closed McLaren dam at High Falls in North Sherbrooke. Boyd Caldwell & Son, which later carried this famous struggle for public navigation rights to a successful conclusion, was then employing seventy-five men on a ten hour day at its Carleton Place mill managed by William Caldwell. 1876 – This newspaper was founded in January 1876, under the sponsorship of William Bredin of Carleton Place, with William W. Cliff of Napanee as editor and publisher. There were 1,800 persons living in Carleton Place. When adverse winds delayed timber drives for several days in the lower Mississippi, some 24,000 sticks of square timber lay in the river between Appleton and Almonte at the end of June. Owners were the Caldwell, McLaren, Mackie, Campbell and Buck & Stewart firms. A Saturday vacation starting date for the province’s public schools was advanced from July 15 to July 7. The Minister of Education addressed a meeting of the county’s school teachers here. Carleton Place had five public and two high school teachers. 1877 – The McArthur woollen mill, equipped to operate by waterpower of the lower falls, was leased and reopened by William H. Wylie when the country’s business depression became less severe. The six largest assessments for local taxes were those of the railway company, Peter McLaren, lumber manufactuer ; Archibald McArthur, woollen mill owner ; Boyd Caldwell, lumber manufacturer ; Abraham Code, M.P.P., woollen manufacturer ; and Horace Brown, grain miller. A tax exemption for the machine works of Gillies, Beyer & Company continued in effect. The tax rate was 14 ½ mills. O’Brien’s Circus visited Carleton Place, Perth and Smiths Falls, with its transportation provided by horses and two hundred mules. Barnum’s Circus showed at Brockville and Ottawa. 1878 – A separate High School of stone construction was built on High Street. During the course of bitter and widespread disputes and litigation, based on a division of business and real estate interests between the north and south halves of the town, the new school, though much needed remained unused for nearly five years. A local option temperance statute of 1864 was brought into force in this area and retained for one year, prohibiting all sales of liquor in quantities of less than five gallons. Alexander M. Gillies and Peter Peden, aged 21 and 24, were drowned in September while duck hunting at night near Black Point in the lower Mississippi Lake. 1879 – In continuance of prolonged controversy over the sites of the High School and Town Hall, the Town Hall on Edmund Street was converted in part into a public school, a step which brought a brief stage of physical violence followed by allegations of riot, assault and libel and a number of related court actions. A planing mill was opened by Abner Nichols (1835-1905) on the riverside at Rosamond Street adjoining the Gillies Machine Works. A lime kiln which continues in operation was built by Napoleon Lavallee, hotelkeeper, on his farm at the present site of Napoleon Street. William Cameron acquired the business ten years later and operated it for many years. With two local woollen mills remaining in operation, the closed Hawthorne Woollen Mill was offered for sale by Abraham Code. A great fire destroyed over thirteen million feet of sawn lumber in the northern part of the Peter McLaren piling yards, together with a section of ties and rails of the Canada Central Railway. The yards extended about three quarters of a mile along the railway line. The lumber firm’s loss was recovered from $50,000 in insurance and $100,000 in damages paid when court decisions holding the railway company responsible were upheld five years later in England. Fire engines and men came to Carleton Place from Almonte, Arnprior, Brockville, Smiths Falls and Ottawa, and hundreds of local helpers aided in saving lumber and checking the spread of the conflagration. Life in the Eighteen Sixties in Carleton Place is recalled in the present fifth installment of a series of annals reviewing events in the first hundred years of this community and its surrounding district. The location of Carleton Place at a waterfall on one of the larger tributaries of the Ottawa River and on one of Eastern Ontario’s first railways proved in the Eighteen Sixties to place this community in a position of some advantage in the lumber economy of the Ottawa Valley. A number of new industrial firms were established here. Among them were two sawmills and a foundry each of which grew to become a substantial employer of capital and labour and a leading industry of the town. 1860 – Archibald McArthur (1816-1884), reeve and prominent wholesale and retail merchant, enlarged his business premises here by building a store of stone construction in 1860 near the corner of Bridge and Mill Streets. The young Prince of Wales, later Edward VII, viewed Carleton Place while travelling by coach and railway through Lanark and Leeds Counties in the course of a tour of Canada. Patrick Struthers (1830-1907), merchant and later magistrate, became postmaster of Carleton Place. He continued in charge of the local post office for over forty-five years. 1861 – A steam-powered sawmill was built in the area of the present Riverside Park on the south bank of the river. The old Muirhead sawmill, which was located near the present electric power plant, was leased and reopened by Robert Gray. Brice McNeely Jr. (1831-1920) began a forty year period of operating the long established tannery. The town bridge across the Mississippi was rebuilt. 1862 – In the infancy of the town’s present leading industry, a new foundry was opened on the Perth Road, now High Street, by David Findlay (1835-1890) for the manufacture of stoves, ploughs and other castings. Canadian military preparations were begun in view of risks of the United States Civil War leading to war between Britain and the United States. At Carleton Place a volunteer rifle company, with newspaper editor James Poole as its captain, was equipped to take the place of the townships former militia regiment. A new infantry company was formed at Almonte. In a match at the Almonte exhibition grounds between the Carleton Place and Almonte cricket clubs, the Almonte club’s resplendent uniforms featured white caps, pink shirts and white pantaloons. 1863 – The Ramsay lead mine at Carleton Place resumed operation. A woollen mill at Appleton built by Robert Teskey (1803-1892) was opened under the management of his son John Adam Teskey (1837-1908) and son-in-law William Bredin. In a target shooting competition at Carleton Place between the local Rifle Company and the Almonte Infantry Company, the rifle company appeared in its new uniforms with green tunics, grey pants with red facings, and dark belts. The infantry uniforms had scarlet tunics, grey pants and white belts. The impressive headpiece of both companies’ uniforms was an ornamented cap known as a shako. 1864 – The Brockville & Ottawa Railway Company’s line was extended and opened from Almonte to Arnprior, providing rail transportation between the St. Lawrence River and Grand Trunk Railway at Brockville and the Ottawa River at Sand Point. George Lowe became the station master at Carleton Place. 1865 – A temperance society known as Temple No. 122 of the Independent Order of Good Templars, was formed at Carleton Place to oppose the sale of alcoholic beverages. A proposal to apply a local option Temperance Act to Beckwith township including Carleton Place was rejected by a majority of thirty votes. The Beckwith municipal council elected for 1865 was Patrick Struthers, reeve, and Archibald McArthur, Donald Carmichael, George Kidd and Alexander Ferguson. 1866 – This town’s first large scale business had its start in 1866 with the opening of the Gillies & McLaren lumber mill with thirty employees. James Gillies (1840-1909) came as its manager. Five years later John Gillies (1811-1888), who had founded the firm in Lanark township, removed to Carleton Place. Both remained here for life and were leaders in the town’s industrial growth. James Gillies for over thirty five years was head of the later widespread lumbering operations of Gillies Brothers, a position occupied from 1914 to 1926 by his brother David Gillies (1849-1926) of Carleton Place. A shingle mill also began business here in 1866, managed by John Craigie. He was the builder of the town’s first two steamboats, the Mississippi and the Enterprise. The local grist and oatmeal mills were bought by Henry Bredin from Hugh Boulton Jr. They continued to be operated by James Greig (1806-1884), who ran these mills from 1862 to 1868 after the death of Hugh Boulton Sr., founder of this first industry of the community. The union of Lanark and Renfrew Counties was ended in 1866 by the establishment of a separate Renfrew County council and administration. Raids from the United States upon border points were made in 1866 by groups known as Fenians, whose professed objective was political independence for Ireland. The Carleton Place and Almonte volunteer companies were dispatched to Brockville in June. Captain of the Almonte company was James D. Gemmill. Total of all ranks serving from Carleton Place numbered fifty-seven. Under local officers Captain James C. Poole, Lieut. John Brown and Ensign J. Jones Bell, they included such Carleton Place and township family names as Burke, Coleman, Cram, Dack, Docherty, Duff, Enright, Ferguson, Fleming, Hamilton, Kilpatrick, Leslie, Lavallee, Moffatt, Moore, Morphy, and McArthur, McCaffrey, McCallum, McEwen, McFadden, McNab, McNeely and McPherson, Neelin, Patterson, Pattie, Rattray, Sinclair, Stewart, Sumner, Williams, Willis and Wilson. Volunteers from these and other Lanark County areas served also in the Fenian Raids of 1870. Drill halls built in 1866 at county centres including Perth, Carleton Place and Almonte were used for many years. The Carleton Place drill shed was at the market square between Beckwith and Judson Streets, at the present site of the skating rink. Almonte’s military quarters were combined with the North Lanark Agricultural Society’s main exhibition building then being erected. 1867 – Canadian confederation was hailed in Carleton Place by a day of celebration which extended from a sunrise cannon salute to an evening of torchlight processions and fireworks. There were speeches by the clergy, a military parade with rifles firing, a costume carnival and sports events featuring novelty races. A new sawmill was built by the Gillies & McLaren firm to employ up to a hundred men. At Arklan Island a smaller sawmill was built by William Bredin. Erection of a large frame building on Mill Street for use as a woollen cloth factory was begun by Allan McDonald. The Allan McDonald foundry was reopened by John Grant and operated for four years, producing stoves, ploughs, ploughpoints and other castings. A local house construction boom was under way. Daniel Galbraith (1813-1879) of Ramsay township was elected to the Ontario Legislature of North Lanark. He represented this constituency in the House of Commons from the following election until his death in 1879. 1868 – Building of the Canada Central Railway between Ottawa and Carleton Place was begun and was completed two years later. In ceremonies marking the start of construction, held at the Carleton Place end of the line and attended by Richard W. Scott, Q.C., M.P.P., of Ottawa, the sod turning ritual was performed by the Rev. J. H. Preston of St. James Church, Carleton Place. 1869 – This towns second large sawmill business was started by Boyd Caldwell (1818-1888) and managed by his son William Caldwell. It operated for twenty-two years on the site of the present Riverside Park. An enlarged stone grist mill building was erected by William Bredin on Mill Street, together with buildings occupied in the following year by Joseph Cram as a planing mill and by John F. Cram as a tannery. A stone church building for the Zion Presbyterian congregation was built at the church’s present Albert and Beckwith Street location. The Mississippi Navigation Company was incorporated to build locks at Innisville and Ferguson’s Falls and open navigation from Lanark and Playfairville to Carleton Place. Its directors were James H. Dixon of Peterborough, Abraham Code, M.P.P. (then owning mills at Ferguson’s Falls) and Robert Bell, John Craigie and Robert Crampton of Carleton Place. The company’s brief existence ended with the building of a steamboat, The Enterprise. Bought by the Gillies & McLaren firm , The Enterprise plied the Mississippi Lakes for about twenty-five years in the service of the lumber industry and provided transportation for many of the town’s public events of bygone summer days.